Designed for sportfishermen, cruisers, sailors and sailing racers who demand high performance, ease of operation and feature integration in a chartplotter/sonar combo. 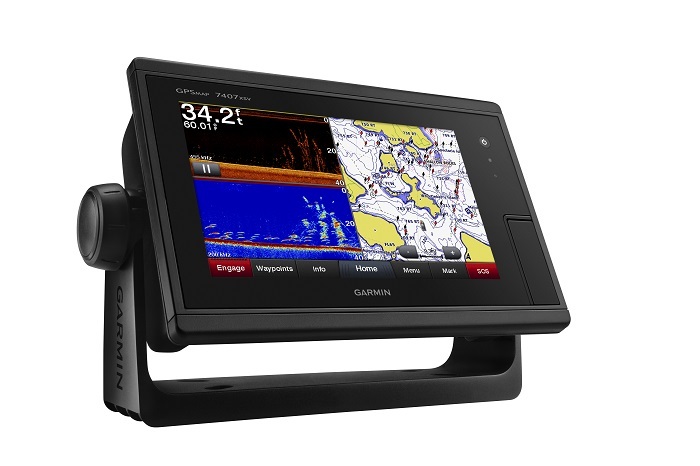 The 7-inch multi-touch widescreen GPSMAP 7607xsv combo includes built-in dual CHIRP sonar plus CHIRP DownVü and CHIRP SideVü scanning sonar with the clearest images on the water. Its internal 10 Hz GPS updates your position and heading 10 times per second. GPSMAP 7607xsv is fully network capable, including Garmin Network and NMEA 2000, and offers the conveniences of built-in Wi-Fi connectivity. The built-in sonar capabilities of the GPSMAP 7607xsv include 1 kW dual CHIRP sonar, the most sophisticated sonar technology available for the fishing and boating public. Dual CHIRP sonar provides amazingly clear target separation and definition because it puts even more energy onto the target than CHIRP. It gives you the ability to show low/high, med/high or low/med on the screen at the same time, enhancing your ability to distinguish between game fish and balls of bait fish. It also includes both CHIRP DownVü and CHIRP SideVü scanning sonar that provide nearly photographic sonar images of fish and structure that passes below and to the sides of your boat. DownVü and SideVü provide the clearest scanning sonar images on the water. Also supported are 50 kHz/200 kHz, 77 kHz/200 kHz and Minn Kota and MotorGuide trolling motor transducers (sold separately). GPSMAP also includes sonar-recording capability that coordinates the timing of the sonar return with your boat's position and saves digital information for playback on a computer using HomePort planning software. Full-network compatibility allows you to add more capabilities to your boat. GPSMAP 7607xsv supports radar, autopilot, instruments, multiple screens, FUSION-Link, sensors, remote sonar modules, digital switching, thermal cameras, GRID rotary knob, joystick and keypad control, GXM 52 marine weather receiver and more. GPSMAP 7607xsv allows you to share features with other compatible GPSMAP units, such as radar, GSD 24, GSD 25 and GSD 26 sonar modules, supplemental maps, and user data, including waypoints, routes and tracks. User data entered into 1 chartplotter can be automatically synced with other chartplotters in a network. Two microSD card slots provide expandable memory for accessory map purchases, such as LakeVü HD Ultra with Max Def Lakes or BlueChart g2 Vision that add Garmin patented Auto Guidance and other great features. Built-in Wi-Fi/ANT+ for use with Garmin Helm and BlueChart Mobile. Garmin Helm allows you to view and control your compatible Garmin chartplotter from a compatible smartphone or tablet while providing enhanced situational awareness for the mariner. Easily switch between portrait and landscape mode to accommodate mounting preferences. When using an iPhone or iPad, you can even record a movie of your chartplotter screen to share with friends and family. Download from The App Store or Google Play. Shows real-time moving sonar images below the boat. This screen shows bait drop echo trail movement in purple with sonar history data at left. Scans the area below the boat from front to back and side to side. This screen shows a school of fish sitting against the back side of vertical face, on Pport side of boat 35 feet deep. Scrolls through the data as the boat moves to show the history of entire water columns – from the bottom to the surface and all of the fish in between. This screen shows the boat passing over a stream channel with a school of fish between 30 to 40 feet. Updates are provided with a single ping, providing real-time moving images of what’s in the water. This screen shows a large target (a diver) approaching the boat. Digitally scans the area in front of the boat, creating a forward-looking 3-D view of the bottom, structure and fish. This screen shows fish targets at 10 feet and drawing bottom depth of 20 feet. Quickdraw Contours is a free, easy-to-use software feature already installed on your compatible Garmin combo. It instantly creates your own personalized HD fishing maps with 1-foot contours. Tailor them to fit your needs. They are your maps — you own them. Keep the data to yourself, or share it with the Quickdraw Community on Garmin Connect. There’s no special surveying expertise required. You just fish while it creates maps. You don’t have to wait around or send your files away like other mapping software requires — your results appear instantly. Use with any of the following sonar transducers: Garmin Panoptix, HD-ID traditional, CHIRP-enabled, Garmin DownVü or NMEA 2000-compatible depth. Have more than 1 sonar device installed onboard? Quickdraw Contours automatically selects the most capable sonar device to provide the very best results for you! This chartplotter supports wireless connections to Garmin VIRB X and XE action cameras so you can catch all the action during your time on the water. More importantly, with a simple software update, you can control recordings, take still pictures, and stream video from a VIRB X/XE action camera to your GPSMAP 7400/7600 series chartplotter or 8000/8400/8600 series Glass Helm chartplotter. In fact, you can stream video from up to 4 VIRB X/XE action cameras and view the video on a compatible marine chartplotter. You can even view previously captured images and videos on the chartplotter and display thumbnail previews for easy selection. Control play, pause, seek and replay from your chartplotter. There’s even an automatic slide show mode and the ability to delete unwanted VIRB images or videos. Each VIRB can be named for easy identification. You can also control your VIRB cameras to change VIRB video settings, including aspect ratio, video resolution, frames per second, photo size, field of view and more — directly from the marine chartplotter. Send NMEA 2000 boat information from the chartplotter to VIRB X/XE to be overlaid as G-Matrix data on the video using VIRB Edit or the VIRB mobile app. Some data requires optional accessories.